General Appearance: A neat compact body and docked tail. Moderately long, glossy coat with feathering on legs, ears, chest, and belly. Carriage is proud and upstanding. Size, Proportion, and Substance: Height-males, 20 inches at the withers; females 19 inches. Weight-a 20 inch dog should weigh 49 to 55 lbs. Length about equal to height. Background: The English Springer is a medium-size, fun loving dog adaptable to city or country life. He is smart, adoring, and eager to please. English Springers learn quickly and remember well. He thrives on exercise and training. 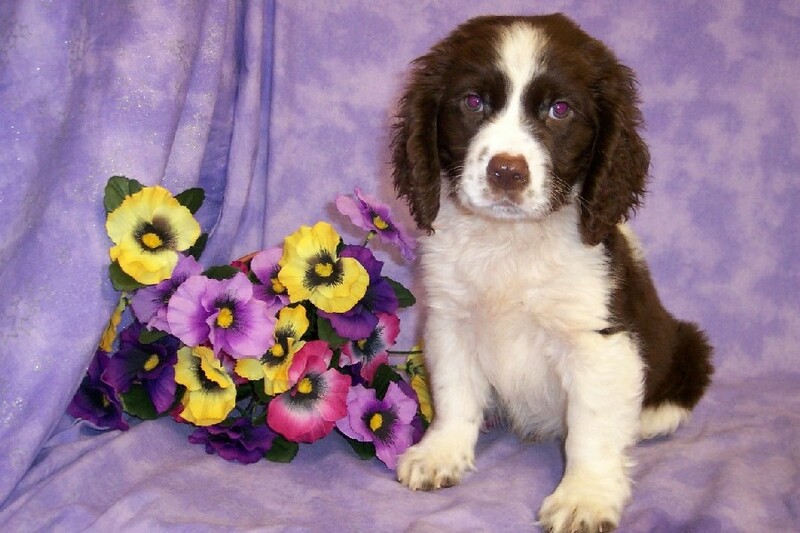 With appropriate training Springers excell as show dogs, hunting dogs or family pets. They interact well with children and are tolerant of rough play. Their coat needs frequent brushing if kept long must be cut every 2-3 months.